GP racing in 1914 and 1934 - with a team that mixed the old and the new. Its manager was almost a throwback; its car was startling, and accepted without question by contemporary pundits (although with hindsight it can be seen to have been a dead end); and its number one driver was to bring success to the venture, for Juan Manuel Fangio scored 41 World Championship points driving Mercedes in 1954 while his team mates amassed 20 between them. The W196 bristled with novelty, so far as Fl was concerned. It had a tubular space frame, independent suspension front and rear, the latter by low-pivot swing axles, inboard brakes, and a straight eight with direct fuel injection and desmo­dromic (positively operated) valve gear which was laid over at 37 degrees to the horizontal to reduce frontal area. Initially the cars were run with full-width bodywork, but shortcomings meant that normal open-wheel bodies were hastily made and used on all save the fastest circuits where the Stromlinienwagen were still used. A short wheelbase version was built in 1955, necessarily with outboard front brakes. The engine was initially rated at 257bhp, then up to 290bhp in its second racing season, and save for a Gordini unit was the last straight eight to be seen in main-line single-seater racing. The W196s were run in twelve World Championship races in 1954-5, winning nine before Mercedes withdrew from racing. 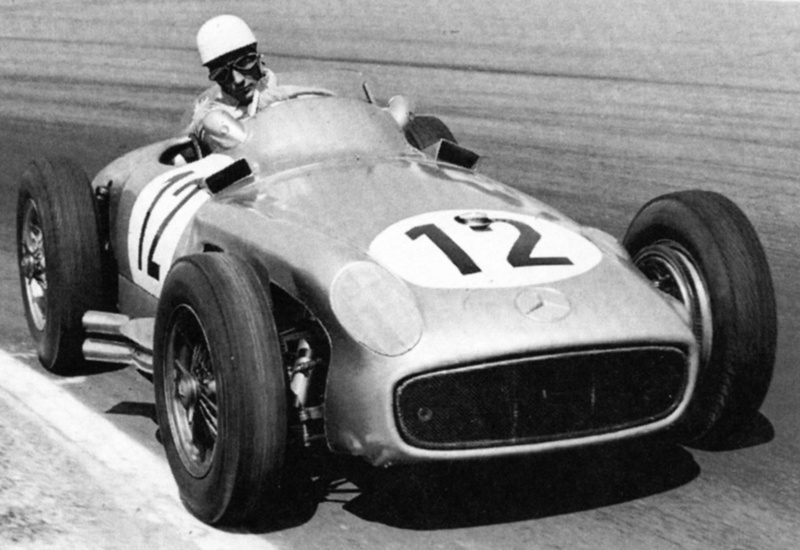 Although expenditure was miniscule by today's standards, compared with their Italian rivals in the mid-1950s Mercedes threw money and resources into the programme, and fortunately for the reputation of the 'Silver Arrows' they threw some of it in the direction of the greatest drivers of the period, Fangio in 1954-5 and Moss in 1955.Drivers: Juan-Manuel Fangio, Hans Herrmann, Karl Kling, Hermann Lang, Stirling Moss, Andre Simon, Piero Taruffi. 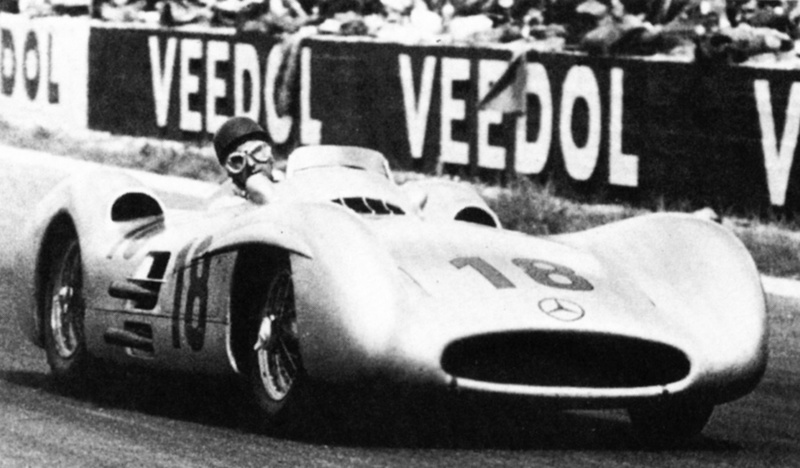 The first race for the W196 was the 1954 French GP at Reims, won by Fangio in one of the streamlined cars. Stirling Moss in a conventional open-wheel W196 on his way to victory in the 1955 British GP at Aintree, where he headed a team 1-2-3-4. In this form the car appeared purposeful although far from handsome.